Since Indian children are still over-represented in Michigan’s child welfare system, Greenleaf-Maldonado, a Tribal Court Judge for the Little Traverse Bay Bands of Odawa Indians, and many others worked for years on an even stronger state version of the law. It passed in January with almost unanimous bi-partisan support. 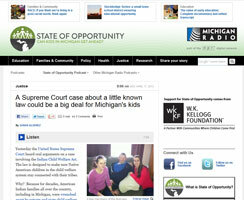 Now, the U.S. Supreme Court might throw a wrench into Michigan’s progress. The court is examining the federal Indian Child Welfare Act and nobody knows what t he court will decide. Read the full article at the State of Opportunity website.